305 mm/45 Mk54 х 2 pcs. 76.2 mm/50 Mk422 х 1 pcs. 76.2 mm/50 Mk420 х 1 pcs. 76.2 mm/50 Mk104 х 1 pcs. South Carolina — American Tier III battleship. The first dreadnought in the U.S. Navy. Due to limited dimensions, the ship carried relatively weak armament and had a low speed. Battleships of her class were the first to receive superfiring turrets. This meant she could fire a full broadside with all main battery guns. The first battleship in the American tech tree, South Carolina is a fairly decent ship. For her tier, she has quite good armor and range, which prove to only be a problem when she faces higher tier ships. 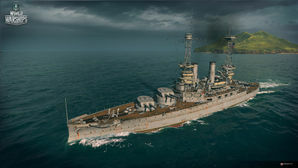 South Carolina is one of the first ships in the game to feature superfiring main turrets which allows for maximum firepower while not showing the full broadside of the ship. She does have severe limitations, however, when it comes to her top speed — a pattern that is repeated with the succeeding U.S. battleships until the Tier VIII North Carolina — and maintains a still painfully slow top speed of only 18 knots when fully upgraded. Players who want to do well with her must utilize her strengths. She is not a long-range sniper; she is a brawler. Make sure that South Carolina is always headed towards the fight. Load AP shells and citadel cruisers and battleships at close range; turn away and kite once the enemy begins to give chase. Don't be afraid of destroyers; blast them with a broadside and turn away in anticipation of their torpedoes. Just like any other ship, it's generally best to remain with the fleet and always angle her armor from enemy battleships. Decent guns for tier: receives eight 305mm guns with best-in-tier range and better handling than some of her counterparts (such as Kawachi). Superfiring turrets: can train at least half her guns in any direction, and bring all eight guns to bear on most aspects for a broadside. Good accuracy and penetration against broadside cruisers and battleships. Struggles when up-tiered; Tier IV pack a heavier armament and are frequently faster. Poor secondary armament: extremely weak AA armament though unlikely to encounter aircraft at her tier, and ineffective 76.2mm secondary guns leave her vulnerable to destroyers. Abysmally slow top speed: she can make only 15.8kts stock, and not much better upgraded, making her one of the slowest ships in the game. High detection range: worst detection radius of all Tier III battleships, but her gun range does mitigate this somewhat. General sluggishness can be frustrating to new players who may be new battleships. Captains should first and foremost research Propulsion Mod. 2 to improve the abysmal top speed to something workable. Next captains should research Gun Fire Control System Mk3 Mod. 2 to improve the firing range of the South Carolina. Finally, captains should research Hull B to obtain more hit points and some AA guns. Researching Hull B then allows captains to proceed to the Wyoming. The major hindrance to South Carolina’s combat potential is her speed - having a top speed of only 15.8kts (18kts when upgraded) means that most ships — including St. Louis — can easily escape her firing range. Thus, attempting to position this ship correctly can prove very difficult. As such, the propulsion module upgrade is probably the most important to unlock and mount early on to be able to perform better. Although due to the low-tier nature of this ship, it is likely that players will fully upgrade the ship in only a few battles with decent performance. An enemy Clemson maneuvers to avoid South Carolina’s salvo. The South Carolina-class battleships, also known as the Michigan class, were built during the first decade of the twentieth century for the United States Navy. Named South Carolina and Michigan, they were the first American dreadnoughts—powerful warships whose capabilities far outstripped those of the world's older battleships. In the opening years of the twentieth century, the prevailing theory of naval combat was that battles would continue to be fought at relatively close range using many small, fast-firing guns. As such, each of the ships in the United States' previous battleship class (the Connecticut class) had many medium-sized weapons alongside four large guns. This paradigm, however, was soon to be subverted, as American naval theorists proposed that a ship mounting a homogeneous battery of large guns would be more effective in battle. As their ideas began to enjoy wider acceptance, the US Congress authorized the country's navy to construct two small 16,000-long-ton (16,260 t) battleships. This displacement was roughly the same size as the Connecticut class and at least 2,000 long tons (2,030 t) smaller than the foreign standard. A solution was found in an ambitious design drawn up by Rear Admiral Washington L. Capps, the chief of the navy's Bureau of Construction and Repair, which featured heavy armament and relatively thick armor, both favored by naval theorists. However, in balancing the congressionally mandated limits to displacement and the inherent design trade-offs between armament, armor, and propulsion, the South Carolina class' speed was severely limited—an ultimately fatal disadvantage that severely limited their utility in a conflict. With their superfiring main armament, press accounts billed South Carolina and Michigan, alongside the British HMS Dreadnought, as heralding a new epoch in warship design. Both, however, were soon surpassed by ever-larger and stronger super-dreadnoughts. The class' low top speed of about 18.5 knots (21.3 mph; 34.3 km/h), as compared to the 21-knot (24 mph; 39 km/h) standard of later American battleships, relegated them to serving with older, obsolete battleships during the First World War. Thereafter, both South Carolinas were scrapped with the signing of the Washington Naval Treaty. A 12-inch (305 mm)/45 caliber Mark 5 gun on Connecticut. The same guns were utilized on the South Carolinas. This page was last modified on 9 August 2018, at 02:24. This page has been accessed 41,908 times.